When I was a child, I did not like green things. Broccoli, sprouts, lima beans, spinach. No thank you. But like every child living under a tyrannical parentarchy, I was forced to stuff them down my throat in defiance of every natural instinct and inclination I’d ever had. I’d still like to see some science on the correlation between eating green things and growing up big and strong. I have a feeling my mom was full of crap. Then, I was introduced to perhaps the three noblest beings that have ever lived: Kermit the Frog, Yoda, and Swamp Thing. Surely these creatures were not part of the same verdant conspiracy that tormented me at every evening meal. Was it possible that I was a greenist? Was I ascribing negative stereotypes to every green thing based on only a few of my own miserable experiences? Swamp Thing fought against greed and corruption, Yoda taught me l could lift spaceships with my mind, and Kermit said it wasn’t easy even being green. Over the years I’d discover the Teenage Mutant Ninja Turtles, Man-at -Arms, Slimer, Reptile, guacamole, and Mountain Dew, and learned that this much maligned color wasn’t so bad after all. 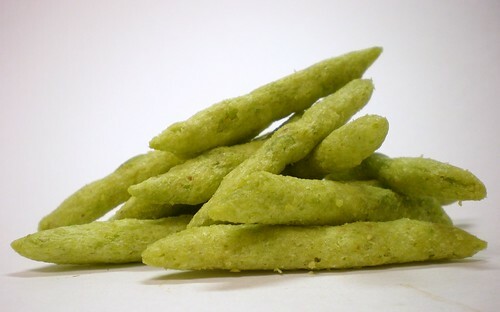 Which brings me to today’s very green snack: Calbee’s Saya Snow Pea Crisps. This is the last of the snacks discovered on my recent trip to the local Asian market. 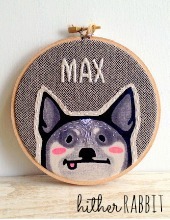 The bright bag and the adorable pea mascot drew my attention immediately. 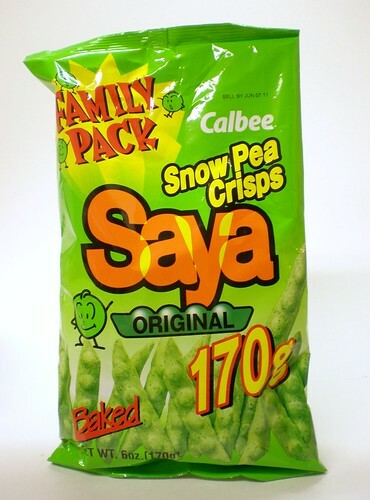 But I was not exactly sure what snow pea crisps were and couldn’t tell from the picture on the bag if they were actual freeze dried pea pods or crisps along the lines of Cheetos. I guess I could’ve looked on the bag at the word “baked” in large red letters and figured it out, but I was so discombobulated by that point that I was lucky not to be curled up on the floor crying and feeding myself mushy durian fruit. 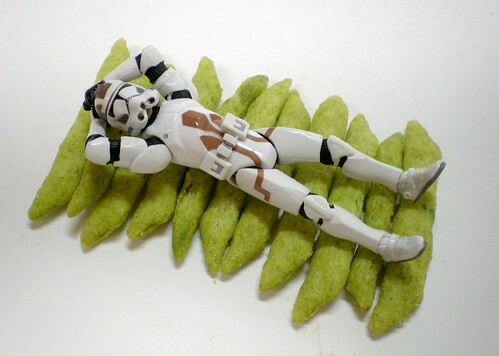 These are indeed baked snacks made of snow peas. They are crispy and light, though not as airy as Calbee’s Shrimp Flavored Chips. 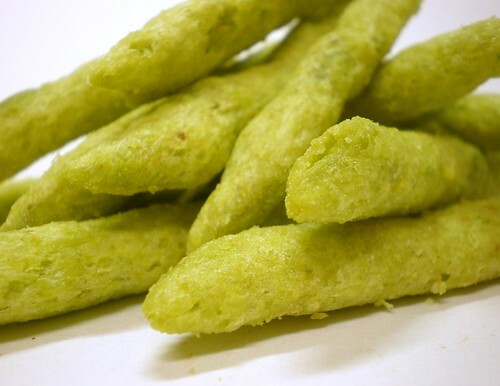 The pea flavor is good and not overpowering. I was expecting a very bright, green tasting flavor but the pea essence is closer to something you’d find in canned peas. That’s not to say the flavor is bad. It’s not. I enjoyed these. There is a slight aftertaste that might put some people off, but I’d consider it well within the parameters of acceptability. I don’t know if I could eat these all the time, but every once in a while would be about right. Bring a bag to work and they will surely spark some conversation while you establish yourself as the adventurous snack gourmand of your cubicle cluster. I must caution that these do contain MSG, which, if you recall, was the chemical that turned Dr. Alec Holland into the Swamp Thing. So if fighting for good as a human/plant hybrid is something you’ve always wanted to try, I’d go ahead and order a case. The world is full of Dr. Arcanes who all need to be taken down a peg or two, and now is the time. no surge? does surge not beat out mountain dew as the ultimate green soda? what about ecto-cooler a.k.a. slimer’s peepee? were these not worthy of mention? regardless, i believe i’ll still join your swamp thing army. Ahh forgot about Ecto-Cooler! Drats! Good one. And there is no excuse for forgetting about Surge. You have shamed me. Well you sure are big. And I mean above the belt. Ha. Nice review. These things are amazing. One important detail you left out is that the third ingredient listed is “natural seafood flavoring” so you get a taste somewhere between canned and fresh peas with a touch of shrimp. Now to find some place locally that carries m\ore than just the small bag..